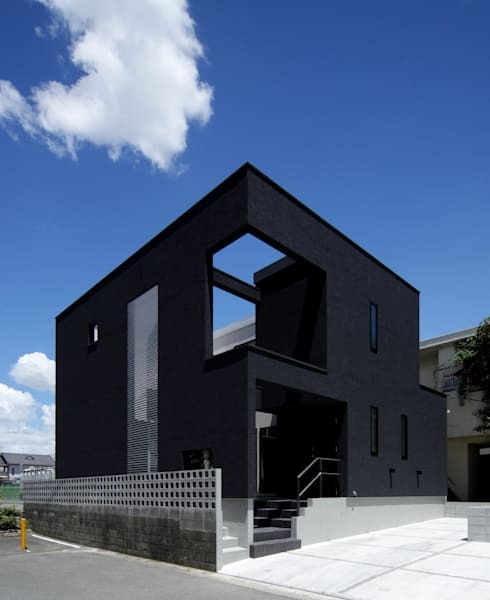 This sleek, black box is located in Fukuoka, Japan and presents a striking contrast to the surrounding neighbourhood, particularly relative to its crystalline, blue backdrop. 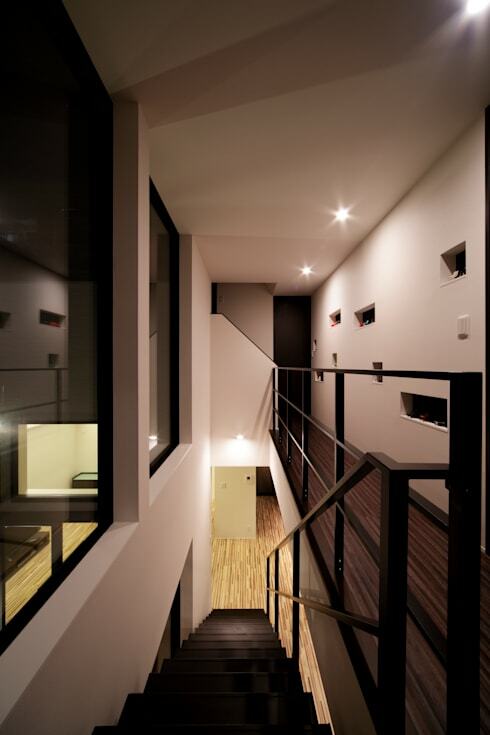 Born of the creative minds at Artect Design, the home exudes a sophisticated, modern air. Exploring the interior we are met with a chic, original design concept centred upon the tripartite combination of black, white and wood finishes. Strong lines and minimalist furnishings characterise the space, with a geometrically designed courtyard garden proving a point of difference within the home's interior, ready for exploration by occupants and visitors alike. Hints of luxury are prevalent throughout, especially in the alluring comfort of the black, leather lounge suite, the stark sophistication of the kitchen and the delicate design of the black dressing room. Let's take a tour and admire the creative synergy the designers at Artect have managed to infuse into this space. The stunning, dark lines of this boldly designed Japanese home stand out against the beautiful, blue sky, presenting a slender, charcoal skeleton against the backdrop. The frame of the home is striking and modern, with the pale grey of the concrete base elevating the strong, black shell. The abode is intriguing in its contemporary grandeur and certainly steals the limelight from the surrounding neighbourhood! The central courtyard emulates traditional, Asiatic horticultural design, with its minimal vegetation and pebbled surface combining to produce an appealing simplicity. Stepping stones are scattered throughout and a line of white pebbles contrasts against the darker tones to provide a decorative element. Indeed, the courtyard appears more decorative than interactive, with warm lighting illuminating the space after dark so that it can be admired by those indoors. 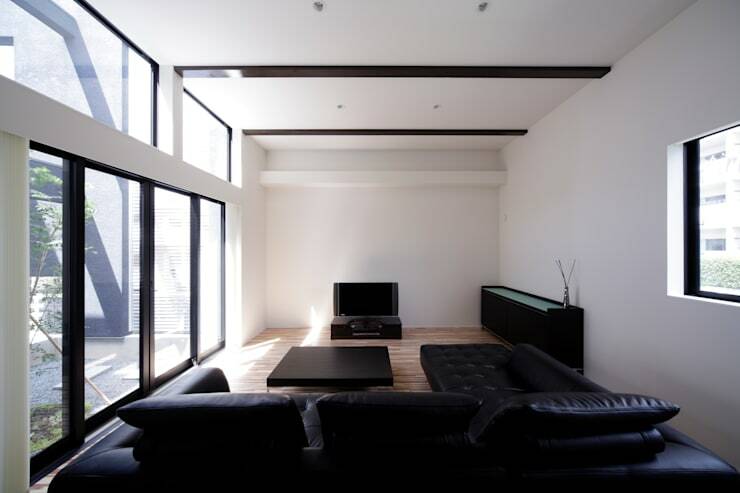 Sleek lines and simplicity also characterise the living area, with the space beautifully balanced in black and white. The lounge suite and coffee table are both low-lying and minimal, immediately creating a relaxed atmosphere within the room. Large glass doors provide access to the courtyard beyond and allow for a beautiful influx of sunshine to permeate the space. Intricate, wooden parquetry peeps up from the floor, adding a subtle, decorative element to the understated colour scheme and furnishings. 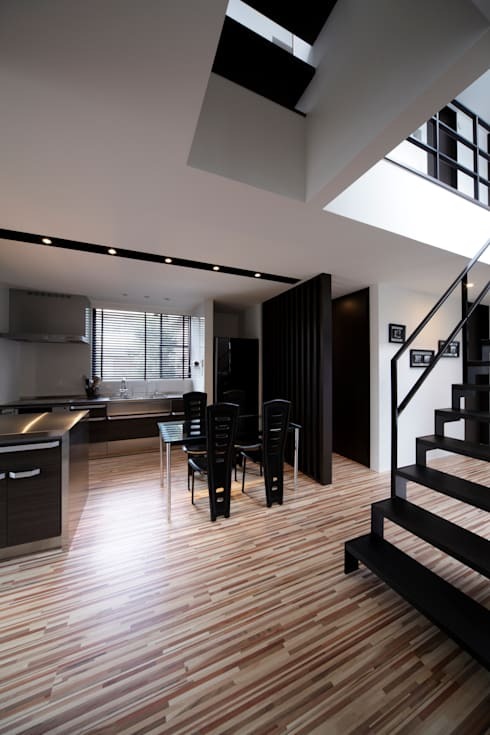 Moving through to the kitchen area we can see the use of black furnishings predominates throughout the home, providing a contrast to the walls and complexity of the floor. The furnishings appear contemporary and sophisticated and balance lighter areas within the space, grounding the elevated, white walls and ceilings. The kitchen also included stainless steel and glass finishes, adding to the theme of sleek, modern living. This view gives a wonderful sense of the complex lines of the parquetry floor, which stream throughout the home like a busy highway. The lines draw the gaze of occupants and provide an interesting point of difference to the minimalistic design of the walls and furnishings. 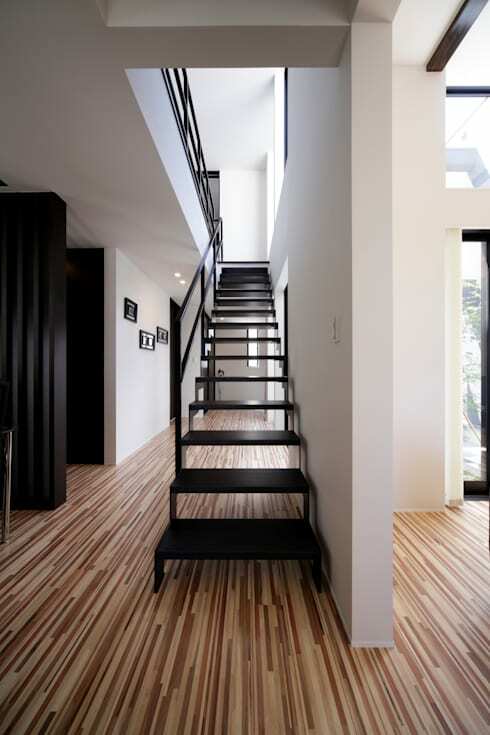 The floor is undoubtedly the hero of the home, adding unique character to the prevailing simplicity of the black and white colour scheme. The upper level of the home continues the tripartite theme of black, white and wood, with interesting elements such as the horizontal shelving in the walls providing a series novel niches to house decorative objects. The space appears open and lifted, with high windows allowing for an influx of natural light during the day time and soft lighting shining a path to the bedrooms after dark. The bathroom of this property has been wonderfully augmented with a beautifully designed dressing area. 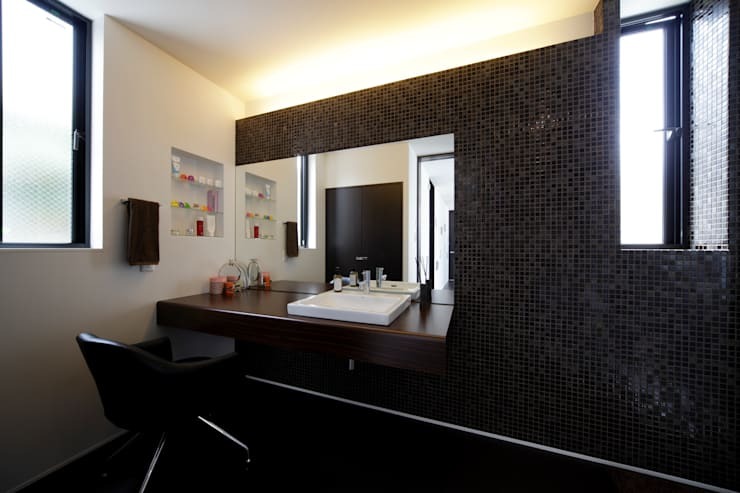 The black tiles of the wall add a sense of delicacy to the dark colour scheme while overhead lighting frames the expansive mirror in glamorous ambience. A chic, black leather chair has been included to add luxurious comfort and accommodate long-haul bathroom beautification. 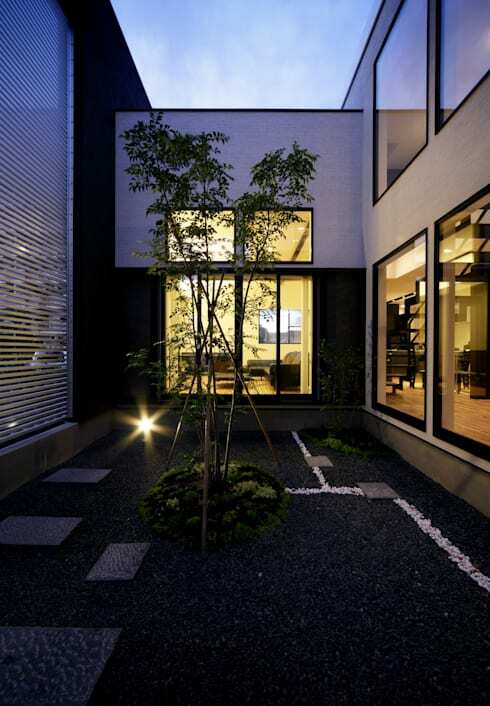 For more Japanese design inspiration have a look at this House in Nanakuma! Do you have any questions about this project? Please share your thought's in the comments section, below!